With events in the Middle East unfolding at alarming speed, University of South Florida professor Mohsen Milani offers his views on the spreading upheaval in this question and answer session. 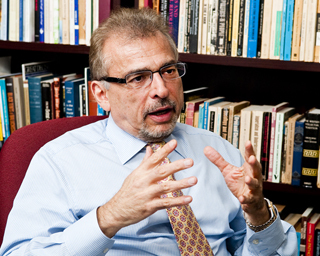 Chair of the Department of Government and International Affairs, Milani is an internationally-renowned scholar who is routinely consulted by government agencies and media outlets around the world for his analysis of developments in the region. He has published more than 50 books, book chapters and articles about the Middle East. His latest piece, “Meet Me in Baghdad: U.S.-Iranian Tensions Flare in Iraq,” was published in Foreign Affairs. He is currently writing a book about Iran’s regional policies toward Iraq, Afghanistan and Lebanon. Q. What is the significance of the uprisings in the Arab world? A. The Arab world has seen many coups and changes of dynasties in the past. But for the first time the Arab masses are employing peaceful and dignified resistance to free themselves from their despotic leaders and build a democratic order. These essentially non-ideological uprisings are bringing dignity and pride to the Arab lands. The crippling feeling of powerlessness and hopelessness that kept these societies stagnant is being replaced with the recognition that political change is possible and desirable and that people can determine their own destiny. Today, we are at a crossroads and face two very different destinations. Is today’s Arab world analogous to Eastern Europe, where after the collapse of the Soviet Union a democratic order blossomed? Or will the “Arab spring of democracy” have the fate of many of the former republics of the Soviet Union where the popular yearning for democracy was crushed and despotism resurfaced in new garb? Q. What commonalities do these uprisings share? A. These uprisings are taking place in countries with young and dynamic populations as well as high unemployment, paralyzing corruption, huge income disparity and pervasive poverty. The governments are suffocatingly repressive and deny basic rights to the people, are generally secular in orientation and have, with the exception of Libya, close ties to the U.S. People have thus far not demanded revolutions, but governmental accountability and transparency, and free and competitive elections. Q. You seem to prefer to characterize what’s happening as uprisings rather than revolutions. Why is that? A. There hasn’t been any revolution, not yet. A revolution is a fundamental, rapid and violent change in the nature, structure, personnel and worldview of the state, which results in a titanic transfer of political, economic and military power from one class or group to another. There have been no massive structural changes or total transfer of power in Egypt or Tunisia, as there were in the Russian Revolution of 1917 or the Iranian Revolution of 1979. In Egypt and Tunisia, two dictators were removed from the existing power pyramid, but the structure of the pyramid itself has remained intact. In both cases, the military is in control and in charge of the transition to a new order -- hopefully a democratic one. In both cases, there has been no fundamental change in their domestic and foreign policies. Still these uprisings, particularly in Egypt, could become a “game changer” in the region. Q. Why do you single out Egypt? Q. The wave of democracy has moved to Bahrain. What is the significance of this? A. This is quite important. It is estimated that some two-thirds of the world’s proven oil reserves are located in the Persian Gulf region. Although Bahrain is not a major oil producer, instability there would further destabilize the entire region, create even more uncertainty in the oil markets, and put still more pressure on oil prices, which would slow down the economic recovery in the U.S.
Q. Do you care to predict what will happen next? A. No, because we have entered into uncharted waters and are at an early phase of a complex process that will take a while before it reaches maturation. For example, should Muammar Gaddafi, the mercurial strongman of Libya, succeed in crushing the opposition and reestablish his dictatorial rule, it would strengthen the hands of other dictators to suppress their opponents. Regardless of the political consequences of these uprisings, we are witnessing a profound shift in the consciousness of a good portion of the Arab population, a shift that contains powerful yearnings for freedom, and, as such, this awakening has frightened every dictator and theocrat in the world. Moreover, a refreshing new narrative of tolerance, non-violence, and freedom is slowly gaining popularity in the region, a narrative that is antithetical to Bin Laden’s ideology of hatred, wanton cruelty and violence, and extremism. And that is extraordinary news.